Broodmares & Foals - NEWS - Winners FOALED & REARED at "Tanglewood"
Care of your broodmare and her new-born foal. Weaning of foals from their mother. Handling of foals to ensure their feeling of trust with human contact. Branding & microchipping of foals. Whether it be for your pleasure, hobby or profit, the care of your broodmare & foal is paramount from the time of breeding, through the time of birth, weaning and thereafter. The preparation of weanlings, yearlings, etc. for the purpose of selling and/or showing is important for a successful outcome. The ultimate mental and physical attributes of your horse start soon after birth. The handling of your horse, after birth and during later preparation is important for the benefit of your horse itself and also for its appeal to owners, potential buyers and admirers. Correct handling from the start of life is paramount to later outcomes for your horse. “Having agisted and foaled-down many Thoroughbred mares at Tanglewood, I can attest to their professionalism and personal service. They understand the horseas requirements". "Having had my "Quarterhorse" mare foaled-down at Tanglewood, I evidenced, at first hand, the care & attention they gave my mare and colt foal. They did a great job and I got a great result. 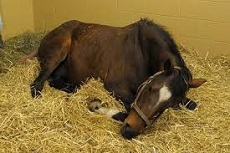 Successful foaling-down of a mare is greatly assisted by the mare's environment prior to foaling. *** Adequate time to adjust to their surroundings. *** A feeling of safety & security. *** An environment free of threats to mare & foal.